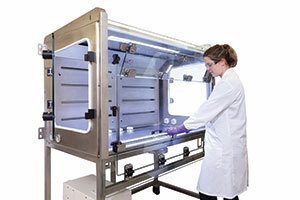 Containment Technology Services (CTS) designs, constructs and commissions mobile and bench mounted laboratory fume hood cabinets and safety containment systems to the pharmaceutical industry. CTS pride themselves on being able to understand both the laboratory process and the containment applications required to provide the best balance of safety and productivity. Temperature and humidity controlled cabinets. CTS provide end-to-end containment solutions ensuring that project requirements are met at every stage of the process. CTS Services include: Consultancy, Commissioning, Design and Manufacture of Bespoke Systems, Servicing, IQOQ, 3D CAD Modelling by Solidworks certified professionals and training on containment awareness and safe weighing. CTS laboratory containment systems are 100% British designed and manufactured, from their Portsmouth facilities, and supplied worldwide. CTS are ISO9001 certified and all their systems are British and European standard compliant. This entry was posted in News and tagged Lab Innovations. Bookmark the permalink.